Veteran psychologist and couple’s therapist Dr. Rick Blum has spent his life listening to clients talk about their relationships and trying to figure out what makes them happy or miserable. 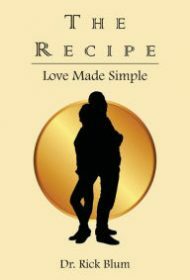 In The Recipe: Love Made Simple, he whips up easily digestible insights into this sometimes-elusive state for those who are single, wondering if they should be, or in a committed relationship that simply needs spicing up. Blum invites readers to skip chapters that don’t apply to their situation, but this book is so tasty they might not want to. The Recipe isn’t a rehash of generic relationship advice but a fresh dish peppered with to-the-point morsels: how to help a distant lover engage again, what to do before ending a relationship or giving an ultimatum, ways to deepen connections with your mate and more. Blum offers strategies for clearing up misconceptions before they turn into full-blown arguments, for resolving conflicts, and for learning to fight fair. For some, the section on feeling whole and fulfilled without a significant other may be eye-opening. “Work to become the member you already know,” he writes, “of the couple you want to be part of.” He suggests giving your date “The Waitress Test” to observe how he or she treats the server, and to think of a rebound relationship as a “sorbet” that may not last as a main course. In one of the most interesting sections, the author explores what to do when you and your spouse regress to your childhood fears at the same time. This is an excellent book, well written and compelling from beginning to end. In the introduction, Blum sets out the basic but tantalizing ingredients, then guides readers with perfect transitions between topics and clear references to previous and future chapters before ending with a concise summary. The Recipe is the perfect blend of salty and sweet, with a generous dollop of humor and warmth. It is sure to satisfy readers looking for relationship advice.